I’ve flirted with Google+ since it launched in June 2011 but haven’t used it in anger. But there's no doubt that the 14-month old social networking platform is staring to gather momentum with recent changes to the Google search algorithm and Google Author expected soon. In a bid to get up to speed I turned to Amazon and discovered Guy Kawasaki’s book What the Plus! Google+ for the rest of us. Kawasaki borrows Steve Jobs' famous phrase, “There must be a better way” to explain the potential for Google’s social network. Google+ is to Facebook and Twitter what Macintosh is to Windows, he says. Kawasaki is one of the original Mackintosh marketing team from Apple and currently plies his trade as a venture capitalist, author and entrepreneur. The book consists of 15 chapters that together form a user guide to Google+ covering topics from circles to comment, and from photos to followers. There are couple of chapters that apply equally to any form of social media on topics such as sharing content, engagement and etiquette that experienced users of Facebook and Twitter might want to skip. Kawasaki writes in plain English and has an encouraging and engaging style. He is candid about his own use of social media and passes on information that any individual or organisation, whether starting out or experienced in social media, will find helpful. It’s the sort of book that you could read from start to finish in a single sitting, or more likely dip in and out of trying stuff as you go. The second edition of What the Plus! 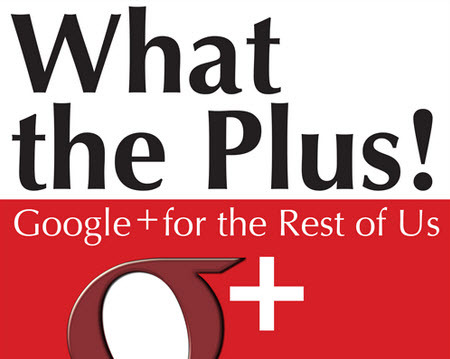 Google+ for the rest of us is published tomorrow by McGraw-Hill at £6.99. Alternatively there is a Kindle edition priced at a bargain £0.49. It’s the first time I have come across an e-book that has been priced to accurately reflect the cost of a digital format. Could this be one of the first examples of the future of book publishing? What the Plus! Google+ for the rest of us is a good basic guide to social networking and Google+.